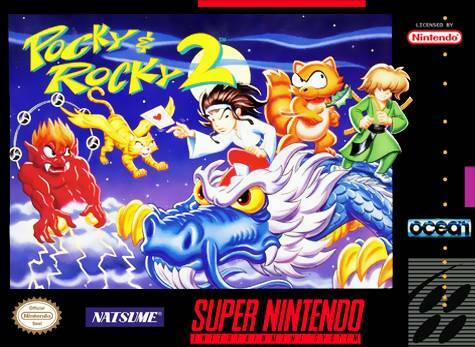 Pocky & Rocky 2 for Super Nintendo is the sequel to Pocky & Rocky (Kiki Kaikai in Japan). The top-down, directionally-scolling action game once again lets players take on the roles of temple girl Pocky and her magical tanuki Rocky as they fight their way through ancient temples, bamboo forests, and graveyards. The gameplay is similar to the original, but with more of a focus on deflective moves and co-operative attacks. Two players can once again team up to play the game together at the same time.